I can't in all honesty promise I'll finish this project but I've decided to give it a try. I've wanted to build this model for many years but other than a couple of pictures, I've not been able to find any other information on it. I'm pretty sure I've figured out how the rotary valve works through a combination of cylinder oscillation and an eccentric driven rod. Finding the single cylinder version finally inspired me to get going with it and that's the model I'll try to copy. Here is a picture of it for those who haven't seen it in my other post. I started work on the bottom cylinder end / valve body today. 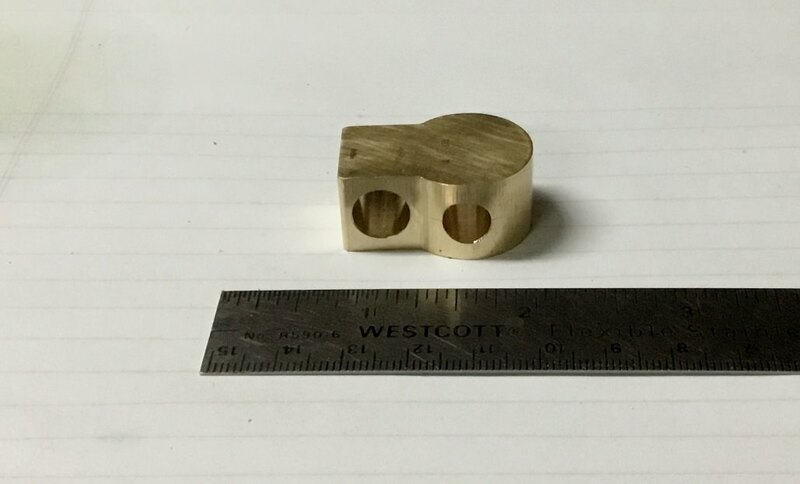 It was carved from a piece of brass and measures 1.25" x 7/8" x 5/8". It's a lovely engine Chuck and I am glad you are going to attempt it. Will definitely be following along on this one. Same here. I always enjoy following your threads. Chuck, that’s mechanical art. I’m betting you’ll do it proud. Are you sure it's a marine engine? I wouldn't think marine engine's would have a flywheel that size. Regardless, it looks like a good model to attempt. Thanks for the vote of confidence, folks. I'm not sure his engine was ever produced full size, let alone for marine use. I agree the flywheel is way larger than you'd expect to see for a boat or ship. Actually, it's probably not suitable for any practical use. Might just have been Henry Maudslay's momentary dabbling with fancy. Dabble away Chuck. You'll do it proudly. 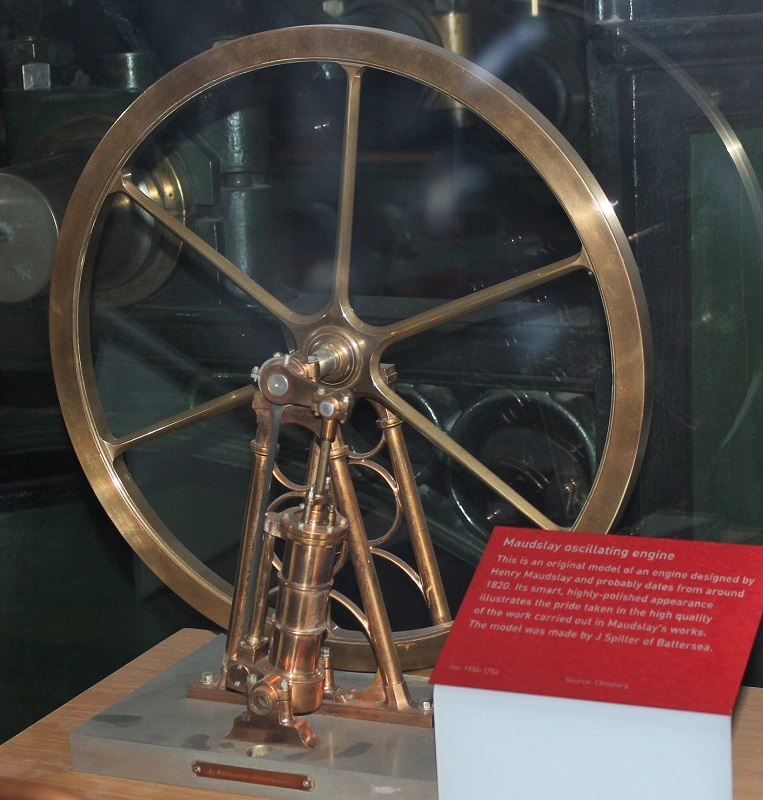 As it was only a model to test his designs it is likely they just put a large flywheel on it for test purposes, the real thing having a big paddle wheel on the ends of the crankshaft. Thanks again, guys, for the kind words. I got a good start on the cylinder and the top cylinder cover. 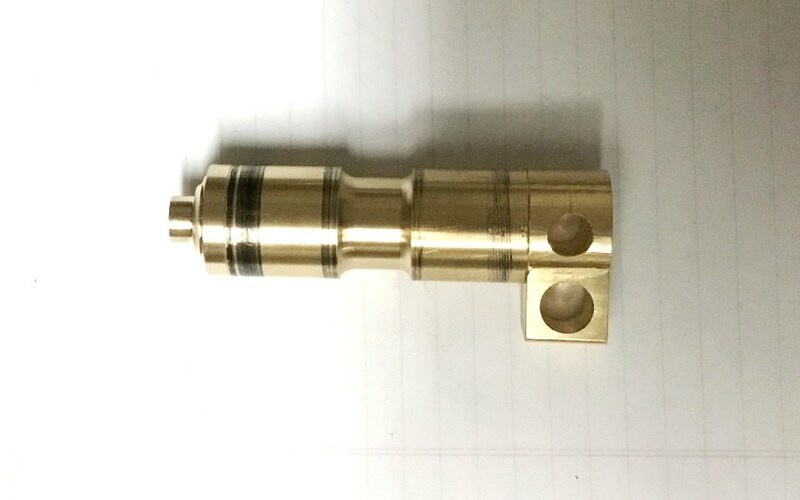 I cut the middle cylinder profile but won't cut the two outer ones until I've finished all the machining operations on the cylinder. 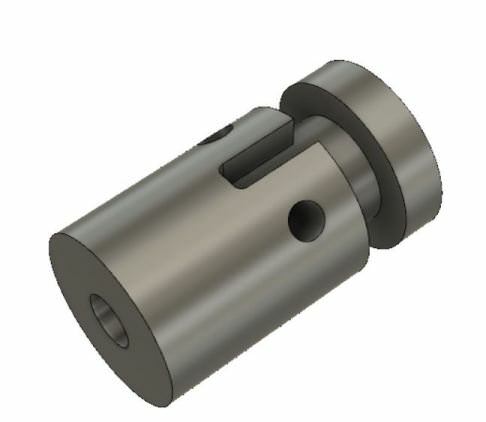 The boss on top of the cylinder cover will be threaded to accept a cap which will hold packing. Not, perhaps very scale, but easy and effective. 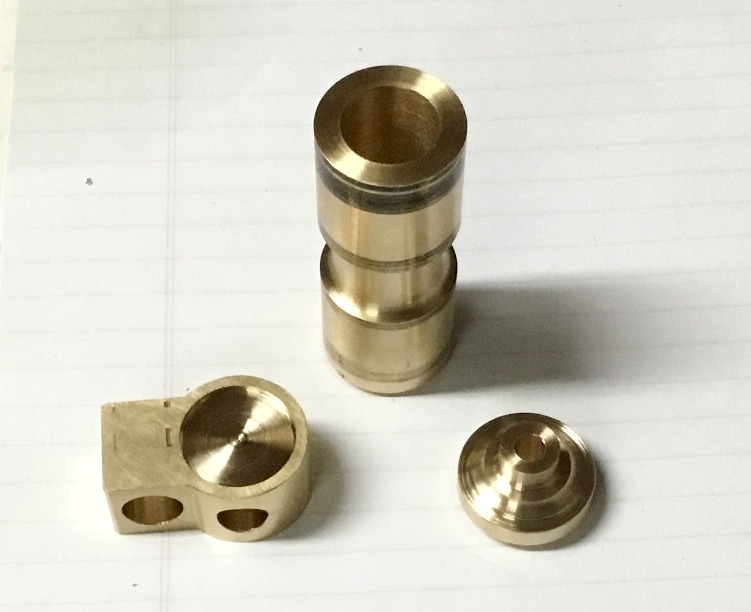 Brass might not be prototypical but it sure is pretty. I'm following along Chuck. Another interesting replica for your collection. I have a question for you folks with more soldering experience. 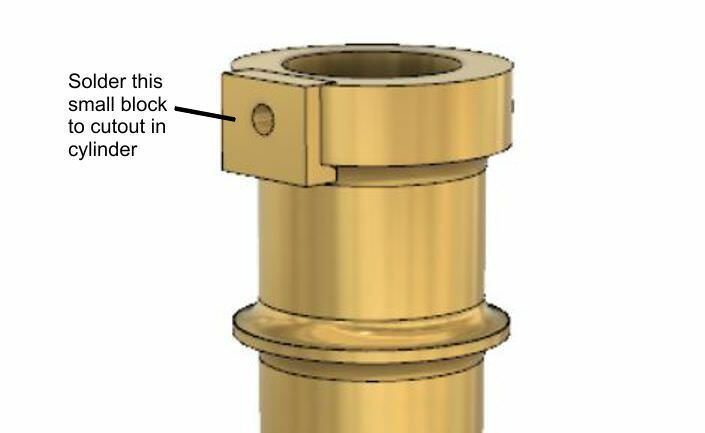 I want to soft solder the small block to the cylinder, as shown in this image. Should I tin the back of the block first? Or just apply flux to the block & the cylinder, put it in place, and flow solder in from the edge? I'd like to get pretty complete coverage of the solder in the joint. I have used the Tix brand solder for this sort of thing a lot on steam engines and ship models - it has a liquid flux, wicks into place very well (it is intended for jewelry making). It is quite strong for a soft solder, though it has a lower melting point than most of them (somewhere around 300F I think), and you need to wash off the flux well afterwards or it will mark up the surface. Not cheap, but very good. Tinning the back is always a little tricky, you would want a spring clamp to push it down as the solder melts, or it wont join up right, and you risk it shifting sideways. Better is to use a prick punch on the flat mating surfaces to make the parts stay a thou apart, and let the solder fill the tiny gap, it will wick right in with the flux. That way, you can use a small clamp to hold the parts in alignment during soldering.